De Blasio told reporters that the concerns he raised with the president elect included the proposed repeal of the 2010 Dodd-Frank Act, proposed tax cuts for the wealthy and corporations, Trump’s proposed undocumented immigrant deportation plan and the NYPD’s unwillingness to assist it, and Trump’s apparent interest in recommitting to the failed and unconstitutional stop-and-frisk method of policing. “We’re never going back” to stop-and-frisk, de Blasio said, also pointing out that there are some 900 Muslim members of the New York City police force. “I left the meeting with the door open for more dialogue,” de Blasio said. “I will be open-minded, but swift to react any time action is taken that undermines the values of New York City.” He declined to characterize the nature of Trump’s responses to his concerns. The New York Times reports that the pair met alone, without aides. In the coming days, the mayor said, his administration will address questions about whether federal officials enforcing a heightened Trump deportation effort will be given access to the city’s IDNYC database, a municipal ID program designed for people with limited documentation. Nearly half a million New Yorkers are undocumented immigrants, and many have participated in the program. 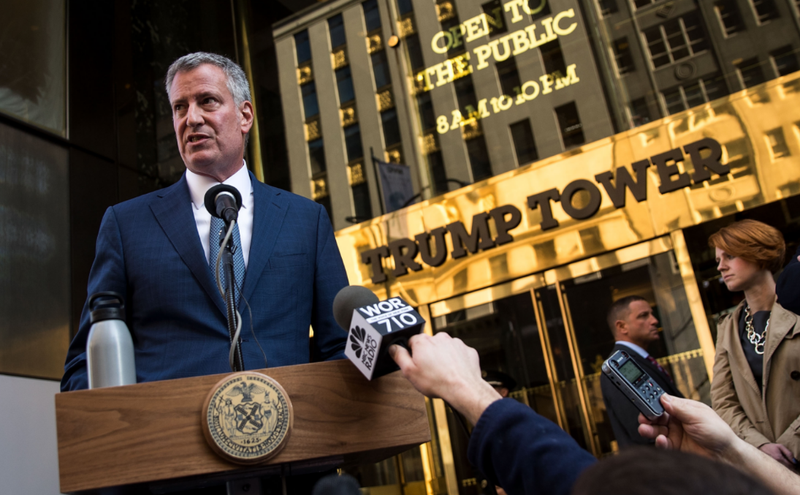 In the wake of Trump’s election, de Blasio is considering destroying the database of New Yorkers’ personal information, rather than being forced to turn that information over to federal law enforcement or immigration authorities.